Photo: Self portrait. Copyright 2011 Colleen M Griffith. All rights reserved. A qualified canine behavioral consultant and training instructor/coach is one who is well educated by reputable and "gold standard" trainers and institutions in the specialties they are working in, and one who also has a proven track record of experience in successfully achieving the results you are looking to achieve. I attended The Academy of Dog Behavior when I lived in Northern California. It was (and still is) taught by Trish King, who is nationally known and is one of the best canine behaviorists and trainers on the West Coast. 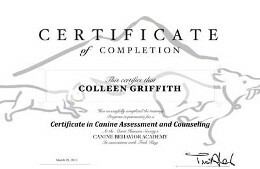 I achieved my CCBS, Certified Canine Behavior Specialist, certification which focused on building a solid foundation in understanding canine behavior and training methods, successfully modifying unwanted canine behaviors, and working with clients. About Dr. Susan Friedman: she has written chapters on learning and behavior for three veterinary texts and is a frequent contributor to popular magazines. Susan has presented seminars for a wide variety of professional organizations around the world such as NASA's Goddard Space Flight Center, European Association of Zoos and Aquaria, and Moorpark College of Exotic Animal Training and Management program. I have logged 832 hours to date teaching, observing dogs at trial, and working with dogs in K9NW, as well as over 100 hours of learning theory attending seminars on the topic, for either the purposes of behavior modification, fun, and/or for the competitive sport. Pronounced In Trial: this is a rare and special recognition given to teams for demonstrating exceptional performance and teamwork in all 4 elements during the same trial. Full-Day Experience At Over 90 Trials: observed hide placements and how all teams worked all 4 elements (Interior, Vehicle, Exterior, Container) and at all levels (ORT, NW1, NW2, NW3, Elite, and National Level competitions). Held the following positions during trials: Element Lead, Judges's Steward, Videographer, Timer, Photographer, Score Runner, Gate Steward, and worked in the Score Room. Trained my working-line GSD for SAR work under several San Francisco Bay Area SAR leaders (they collectively have 80 years SAR experience), until I retired her due to her developing several serious health conditions. Trained my working-line GSD for AKC Tracking under the guidance of several VST & AKC TD judges; trained her to successfully complete an AKC regulation TD track before she needed to be retired due to her poor health. I've trained with well over 50 different trainers & behaviorists (and the number rises each year) either when I lived in California's San Francisco Bay Area or after I moved to Maryland in late 2014. I have been able to learn and apply industry best practices from each of these talented individuals and have seemlessly integrated them into my own repetoire of skill-sets when working with clients and their canine companions. I have also supplemented this hands-on learning, with additional learning experiences through educational DVDs, webinars, & books, some of which are listed in the Continuing Education section at the bottom of this page. Many of the list of trainers/behaviorists in this category (DVDs & books) are in addition to the individual trainers/behaviorists I mentioned above. 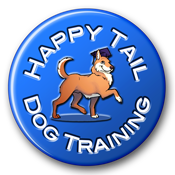 Co-taught and/or assisted group classes to the public for their companion dogs such as basic manners, companion dog, tricks, reducing dog-dog leash reactivity, puppy playgroup, puppy socialization, puppy kindergarten, and K9 Nose Work™. I often think the best teachers of canine behavior are those we live with everyday. I brought my first dog, a Pembroke Welsh Corgi, into my household over 20 years ago. I have raised puppies (including very fearful and shy temperaments) and brought rescue dogs into my household ever since. I grew up with dogs too. In that time, I have successfully managed and/or modified the following unwanted behaviors with my own companion animals: strong territorial aggression, mild aggression between dogs in a multi-dog household, mild to moderate resource guarding, excessive barkng, leash aggression, dog-dog aggression, vet and handling phobias, mounting, and quite a few other issues. 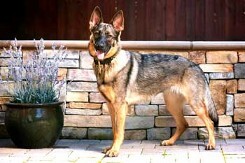 I currently live with a shy and quite sensitive high-drive working-line female GSD, Sadie. Her natural temperament is extremely protective with highly territorial aggressive behaviors and high prey drive, and she has challenging health issues that created some extreme vet phobias. She also had previously intense handling phobias, intense dog-dog leash aggression, mild resource guarding, and moderate shyness towards/fear of unfamiliar people. And I have been able to successfully modify all of her unwanted behaviors except one, which I intentionally chose to manage. Sadie has been a wonderful teacher dog and working with her has filled in the gaps in my knowledge of training and behavior modification including learning what doesn't work. She has also helped to illustrate what methods seem to work in the short term, but instead cause more unwanted behaviors down the road. And despite Sadie's high prey drive, I also successfully integrated her into a household with two elderly cats. Click here for a video of Sadie in the world, at the age of 2.5 years old. I have almost two decades of experience working in manufacturing, quality, customer service, supply chain, education, human resources, process excellence, and executive leadership roles. I obtained a Bachelor of Science and a Masters of Science degree in Chemical Engineering and held engineering as well as domestic and global executive leadership roles while working for global corporations in the Pharmaceutical, BioTech, High Tech, and Fine Chemicals industries. I became enamored with teaching and coaching when I took on my first educator role teaching a chemical engineering class while I was a student working on my BS Chemical Engineering degree - and I have held many educator and coaching roles since then. I also own 3 US Patents and am published in peer-reviewed scientific journals such as Biotechnology & Bioengineering and Journal of Chromatography. Utilizing science and the scientific mindset to discover what truly works vs. what is "urban legend"
Applying my knowledge of fluid flow, obtained through the chemical engineering discipline, to the unique sport of K9 Nose Work - air is a fluid and how particulates/molecules (odor) move through fluids, in a variety of different circumstances was the focus of many chemical engineering projects. Below is a selection of some of the more recent seminars I've attended, plus a short selection of some of the books I've read, some of the DVD's I've watched, and a few reference books I find myself referencing more often than others. I have added a Recommended Books section to the Resources page containing the few books I recommend every dog owner takes the time to read. 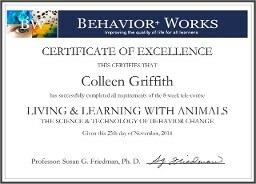 Dr Susan Friedman, Living and Learning With Animals Professional Course: The Fundemental Principles and Procedures of Teaching and Learning, 8 week course, Sept - Nov 2015; repeated this course to deepen my knowledge and fluency of the materials. Took original course in 2014. Dr Susan Friedman, Living and Learning With Animals Professional Course: The Fundemental Principles and Procedures of Teaching and Learning, 8 week course, Sept - Nov 2014.